Smoking cigarettes, drinking alcohol to excess. These activities carry serious and well-known health risks, ranging from heart disease to diabetes, to cancer. But researchers are now finding evidence of another, less publicized health risk: lifelong hearing problems. Read on to find out how your ears might be affected by this risky behavior. Smoking has been associated with an increased risk of hearing loss, according to a study of over 50,000 participants over 8 years in Nicotine & Tobacco Research, published by Oxford University Press. Researchers examined data from annual health checkups, which included audio testing performed by a technician and a health-related lifestyle questionnaire completed by each participant. They analyzed the effects of smoking status (current, former, and never smokers), the number of cigarettes smoked per day, and the duration of smoking cessation on the severity of hearing loss. Even after adjusting for factors including occupational noise exposure, researchers noted a 1.2 to 1.6 increased risk of hearing loss among current smokers compared with never smokers. The more cigarettes an individual smoked each day, the more severe the hearing loss: for smokers who averaged 20 or more cigarettes per day, the risk for high-frequency hearing loss increased to a staggering 70 percent, with a 40 percent risk of low-frequency hearing loss. The researchers also found that passive smoking (exposure to secondhand smoke) may contribute to hearing loss as well. Non-smokers who lived with a smoker were revealed to be 1.94 times more likely to have hearing problems than those who did not share a home with a smoker. There are many known risks associated with drinking to excess, but more and more recent studies are pointing to a direct link between drinking and hearing loss. It is still a less recognized side effect of drinking, but researchers across the world are keen to shed light on the way that alcohol can cause hearing problems, both temporarily and in the long term. Research has shown that heavy alcohol consumption over an extended time can cause damage to the central auditory cortex of the brain and may actually lead to brain shrinkage. And because this damage to the auditory nerve is cumulative, even people who drink moderately may be susceptible to nerve damage and hearing loss. A study carried out at the University of Ulm in Germany examined both heavy and social drinkers BAEP levels (Brainstem Auditory Evoked Potentials) by checking the level of damage in the part of the brain that makes hearing possible. The results showed a clear connection between alcohol and hearing loss. The researchers concluded that drinking can cause brain damage, although the amount of alcohol and the length of the time that could contribute to this are still unclear. In cases of alcohol-related brain damage (to the auditory cortex), the ears may still be working perfectly, but the part of the brain that processes sounds will not be able to carry sound signals to the brain as effectively, resulting in hearing loss. Beyond that, studies show that in cases of prolonged, heavy drinking, such as alcoholism, high levels of alcohol in a person’s bloodstream can create a toxic environment and cause actual damage to the structures of the inner ear, such as the delicate hair cells. This condition, known as ototoxicity, is usually associated with medications that are harmful to the ears. Hearing research conducted with participants suffering temporary hearing loss in the UK, which looked into the combination of alcohol and noise, showed that a temporary hearing loss can be sustained together or separately. The researchers also believe that a regular intake of alcohol may actually cause the kind of long-term, permanent hearing loss which is often attributed to noise-induced hearing damage. The findings of the study indicated that the more alcohol consumed the worse the hearing became, at least temporarily. The ability to hear low frequency sounds–the ones that are crucial to understanding and decoding speech–was especially affected. The UK study also revealed that older participants and people with a prior history of excessive drinking were more susceptible to hearing loss. 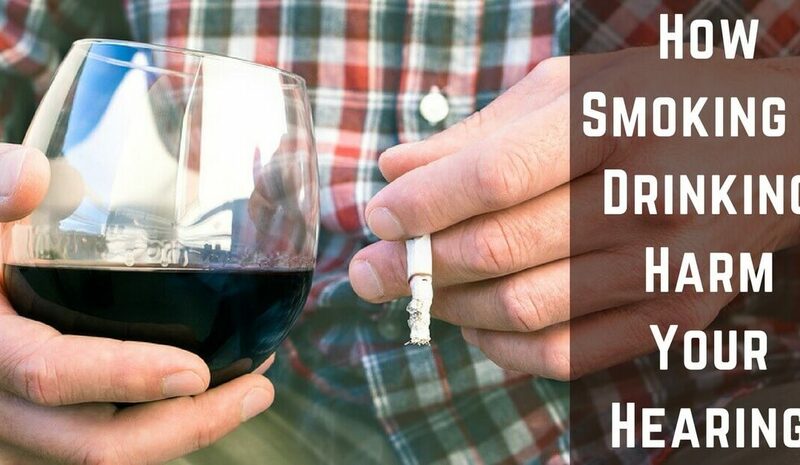 If you have a smoking or drinking habit, it could be harming your hearing as well as damaging your body in countless other ways. Talk to your doctor about effective ways to permanently stop, to preserve your hearing and your health.